Where did 2018 go, and why was it in such a hurry? Such questions, and no answers in sight. I kept plenty busy with side projects throughout the year, including the development and release of a couple of games. My stress levels ebbed and flowed, though my free time remained consistently scarce. And I noticed an interesting trend: whenever I'm feeling overwhelmed by responsibilities, I gravitate toward Japanese RPGs. And when I'm feeling more free and relaxed, that's when I branch out into trying new games. So here's my list of honorable mentions for 2018, helpfully divided up into two categories. So, just to get it out there: we didn't honor Persona 5 last year, largely because none of us had finished it. In fact, I'd fallen off after the game failed to keep me enticed after the first 20 hours. But I came back to the game early in 2018, and I'm grateful I did. As with other games in the Persona series, Persona 5 is a gargantuan game, more akin to watching an entire series of a TV show than any one season. And, as with most great TV shows, Persona games take a little time to get everything they've got to offer out on the table. I wound up sinking 118 hours into Persona 5, all told, and as a result, it monopolized my gaming time for about half the year. But what a ride. And what a soundtrack! I wrote a lot more about Persona 5 and its urgent, timely themes here, so give that a read if you're interested. I'm on a mission, kinda, in life. I want to finish every Final Fantasy game. I say "kinda" because, honestly, the thought of going back and replaying the Famicom Final Fantasy II or Final Fantasy III sound friggin' awful. But 2018 was a good year for knocking out some unfinished business with the latter chapters in the series. I played the original Final Fantasy XII on my PlayStation 2 back when I was in college, and, y'know, I damn near finished it back in 2006. But for whatever reason, I just ran out of steam at the start of the fifth act of the game, and I never went back. Fortunately, this high-definition remaster was an absolute treat. It smoothed off so many of the original game's mechanical rough edges, and — thanks to the inclusion of a fast-forward button — it made reaching the conclusion that much more attainable. 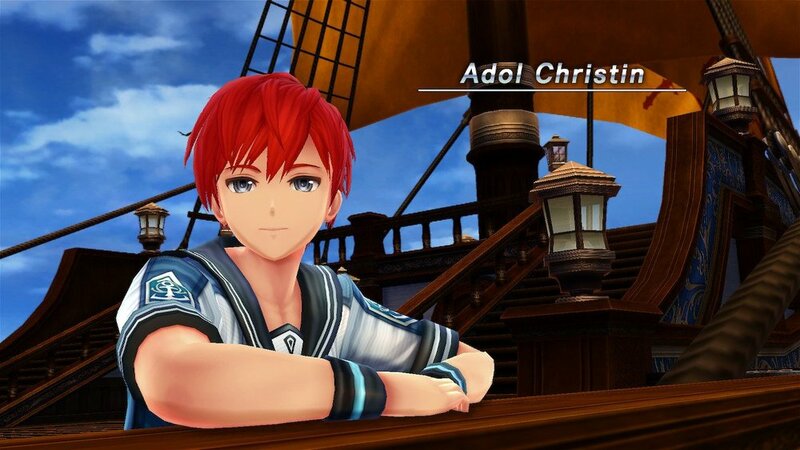 I also chipped away at the earliest parts of Ys VIII: Lacrimosa of Dana. This probably goes without saying, but: this game is anime as hell. It's also an awful lot of fun, cleverly combining the engaging combat of prior Ys games with smart considerations for quest design and home-base development that makes this game feel right at home on my Switch. I'm hoping to get deeper into it again in the near future, now that my sacred Game of the Year responsibilities are drawing to a close. I didn't do much streaming last year, but I did begin a new playthrough of Chrono Trigger. I'm probably about 70% of the way through the game, but it's been a real delight so far! This is a game I know fairly well, and I've enjoyed re-examining it in real time from a critical perspective while also rediscovering the things I always loved about it. Feel free to follow me on Twitch if you'd like to tune in. that’s the expression of someone who’s died quice in a row. quice? frice? welp, won’t have to use it again anyways. This was also the year where I broke with tradition and, during my annual Undertale playthrough, opted to go for my very first "genocide run." 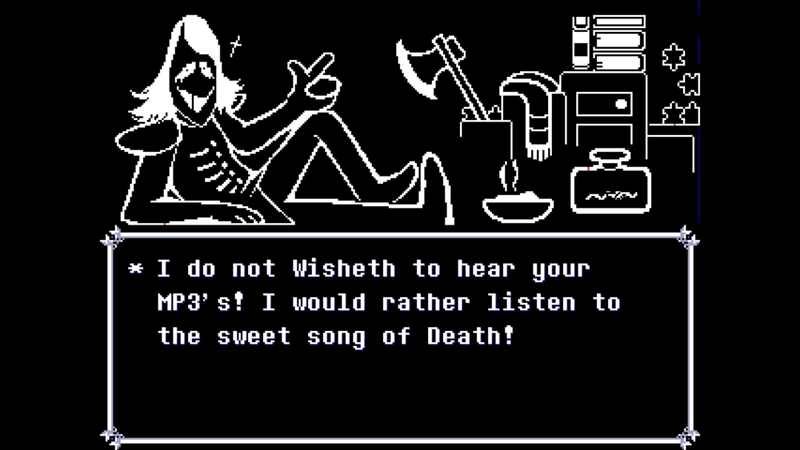 I can't really describe how I feel about Undertale without coming off as, I dunno, weirdly affectionate, but this is a game that I straight-up revere. It's also populated with characters I think very fondly of. So to play through the game with the intention of killing every single one of them was, well, surprisingly difficult to come to terms with. But ultimately, my curiosity as a game designer outweighed my desire to keep getting the "good" ending. I needed to see exactly what happened to the game when you play as an unrepentant villain. And wow, what a difference it makes. Toby Fox's commitment to fully developing his game's premise can't be overstated. Beating the final boss on the Genocide route was one of the most rewarding and difficult things I did all year — and this is also the year where I completed every B-side and C-side in Celeste. I’m never not thinking of you, Ultros! Ben — you know, the curator of a pretty killer Mountain Goats playlist/top 10 games article — hadn't played through Final Fantasy VI before. I have — many times. But I've never actually beaten it start-to-finish before. Ben graciously invited me to come play the game in couch co-op mode with him on his Super NES Classic, and we managed to get a few sessions in before the end of the year. Most people don't know that Final Fantasy VI has a co-op mode built in. It's fairly limited, but it allows you to choose who controls which characters in battle — a small change on paper, but a transformative thing in practice. Boss battles suddenly become tense, strategic conversations where each of us is outlining our strategies in real time as the ATB gauges fill. Winning requires effective communication and the ability to pivot our shared strategy as these boss battles shift unexpectedly. In that sense, it's a fresh challenge that has brought a whole new dimension to a game I already love. It's also been a treat to play the role of the ambassador (and walking GameFAQs guide) for a game that was deeply formative in my own life. I've enjoyed seeing the game again through fresh eyes. It's helpful to see what still connects and what feels dated or just poorly designed. As of this writing, we're just about to go do the big, important thing that leads to that other very big thing that changes everything. I'm psyched. Yep. Another Final Fantasy game. And while VI and XII have plenty of ardent defenders, XIII is largely regarded with disdain. Up until last month, I also thought XIII was just indefensibly bad. Despite its stunning visual direction and viscerally pleasing battle system, it just was such a shambling mess of heavy-handed narrative direction and inexplicably stilted writing and acting. I'd tried to play through it twice before, once in 2010 and again in 2012, and in both instances I gave up about 2/3 of the way through. "I should go back and finish Final Fantasy XIII." I was confused. Why would I want to go back and finish a game I hated — a game I hadn't played in six years? Well, anyway, to make a long story short, I did it. I resumed from the start of chapter 11, which is where the party finally arrives at the open-world segment of the game, and I powered through a lot of those challenges before I proceeded to wrap up the story. All of the problems I noted with Final Fantasy XIII years ago were still there. The majority of the game is effectively one exhausting, overly linear tutorial sequence that takes dozens of hours to complete. And by the time you get to the open-world section, it feels like too little, too late — especially given that Final Fantasy XII and Final Fantasy XV have both done the hunt-driven optional side-quest system far better than XIII did. And yes, the story is still off-putting and disposable. Once the game finally unshackles you from its interminable, mandatory tutorial and allows you to choose your party's lineup and disciplines as you see fit, what we're left with is — at the risk of sounding hyperbolic — the absolute most fun active battle system the series has ever seen. Which is fortunate, because the lineup of bosses that stand between the player and the conclusion of the game are some of the most challenging I've ever seen. I died dozens of times in those final chapters, but each time felt like a valuable learning opportunity to reassess my strategy. I've fumbled my way to the credits in many Final Fantasy games before, but it's rare that I feel like I need to earn that final victory. In Final Fantasy XIII, I fought tooth and nail to win — and it was all the more satisfying for that. Anyway. Don't play it. It's still a hot mess. But that final third of the game? Yeah — it really is pretty cool. Gosh, I just love the work Toby Fox does. When he announced that a "SURVEY PROGRAM" would be going out on Halloween, I had no idea what to expect. I figured it'd be just that, or maybe a tiny playable something, but what I got instead was a four-hour chunk of something new, something strange, and something wonderful. 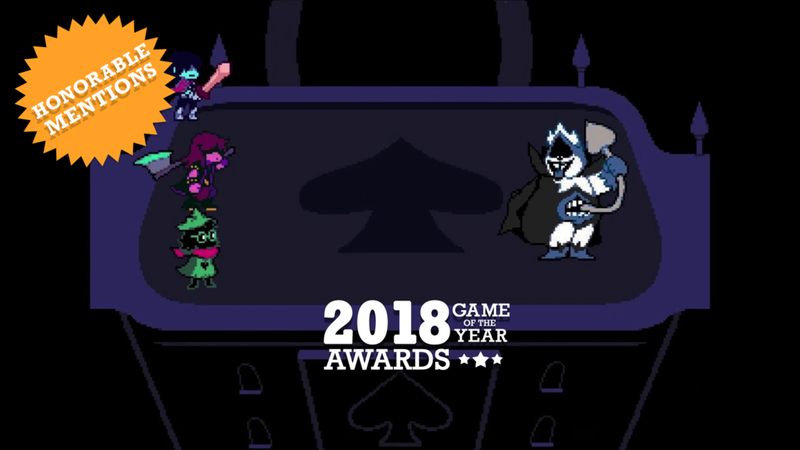 I still have no idea what Deltarune is going to be, ultimately, and I can't wait to find out. I didn't play much of this but it's so great! Play it! Hashtag big mood hashtag two thousand eighteen hashtag we are filthy trash monsters. Someone added "Baba Yetu" from Sid Meier's Civilization IV to Beat Saber's excellent custom-song directory and so I regret to inform my colleagues that this is, in fact, our actual Game of the Year for 2018. Ok, but for real: Beat Saber is the most exciting thing to happen to rhythm games since Rock Band. Touch-based VR gaming allows for an unprecedented level of precision, enabling the player to draw upon a lifetime of learning how to use their body to intuitively hit targets in time to engrossing visuals and heavy beats. My favorite custom: Taylor Swift's "Shake It Off." Seriously. This note chart is inspired. Maybe someday if I work up the courage I'll do a livestream again just to show y'all what you're missing out on by not getting down to this. sick. beat. If you, like me, have strong aural memory association, and if you, like me, grew up playing video games constantly, you'll likely find Super Smash Bros. Ultimate to be weapons-grade nostalgia. It also happens to be the most fun I've ever had with a series that I love. Pick it up, invite your friends over, and have a blast. Ok. That's it for 2018. Onward!